“So what you are telling me is, if I hook up these two electrodes to my head and let you transmit electricity through my brain, I can enhance my ability to play Call of Duty?” I ask Dr. Andy McKinley, who had two wires dangling from one hand and a bottle of electrically conductive gel in the other. Once again, I found myself at the Air Force Research Laboratory (AFRL) at Wright Patterson Air Force Base, Ohio, or as I call it “a nerd’s paradise”; the reason I continue to go back. Last time I was here, I was trying to wrap my head around some of the most technologically advanced gadgets, gizmos and weaponry in the military. This time, I was going to have one of those technologically advanced gadgets wrapped around my head. The method by which I hoped to achieve this metamorphosis resided with a biomedical engineer, Dr. Andy McKinley, who works in the Non-Invasive Brain Stimulation (NIBS) laboratory. He would introduce me to the powers of transcranial direct current stimulation or tDCS. Transcranial DCS is one of the latest areas of research in the realm of human performance enhancement. Its effects are like slamming a Redbull tallboy and chasing it with a grit-filled cup of Joe, minus the shaky jitters and the irritability. After just 30 minutes of stimulation, research suggests that the recipient’s level of concentration achieves a laser focus. The goal: enhance the performance of warfighters who have answered the real-world call of duty. 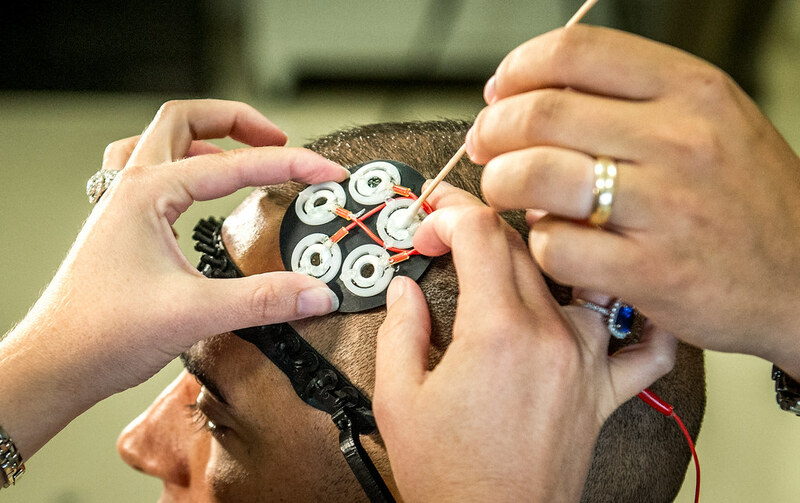 Electrodes to administer directed electrical brain stimulation are placed on the head of a test subject before he performs a multitasking cognitive test in the Non-Invasive Brain Stimulation (NIBS) lab at the Air Force Research Laboratory, Wright Patterson Air Force Base, Ohio, Jul 19, 2016. 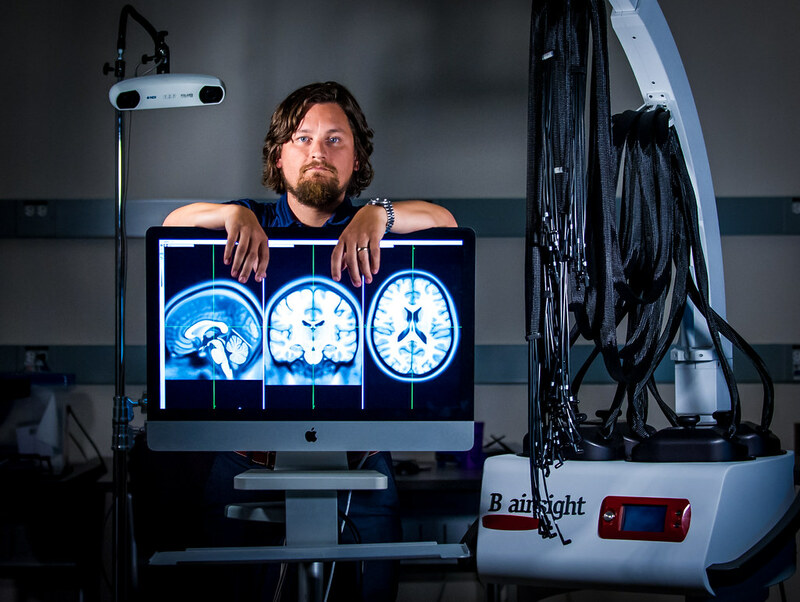 Researchers working in the NIBS lab, led by Dr. Richard A. McKinley, Ph.D., are exploring how transcranial direct current stimulation of the human brain affects cognition, fatigue, mood and other areas with the end goal of improving warfighter awareness, memory and focus. Photo // J.M. Eddins Jr.
McKinley sits me in front of a computer monitor with a program on the screen similar in quality to a 1980s Atari game. He explains, “We needed to establish a baseline.” Recording my unaided performance will enable McKinley to measure any improvements once he administers tDCS. So, it’s just me versus the Multi-Attribute Task Battery (MATB), a multitasking cognitive test; no jumper cables to give my brain a boost — yet. He gives me a series of seven items to monitor, with the following basic instructions: “When this goes up; press this, when that goes down; press that; when you hear this; do this, when you hear that; do that.” The program was set to difficulty level 1: equivalent to tying your shoes and chewing gum at the same time. “Let’s do this,” I say. Following seven grueling minutes of darting my eyes around the screen to keep up with changing readouts and tapping buttons and throwing switches, the first test is over. According to the results, apparently I have a severe lack of focus when task saturated. It’s what pilots call cockpit overload or a “helmet fire”. With the baseline established, McKinley gives me the ole’ “you aren’t as bad as it seems,” but the numbers don’t lie – I am that, “below average,” participant. It is now time to find out what a little brain-lube and electricity can do for my below averageness. But first, I have to sign a series of waivers, which basically say if my brain gets fried, I agree that it was a noble sacrifice in the pursuit of greater scientific understanding. Using the Brainsight Neuronavigation System, Dr. McKinley pinpoints where to place the electrodes on my head to stimulate a specific area of my brain. Then those dangling wires are attached to my head along with a dab of conductive gel. The wires are a combination of electrodes to deliver the electrical stimulation and Near Infrared Spectroscopy (fNIRS) sensors to measure changes in oxygen levels in my brain. 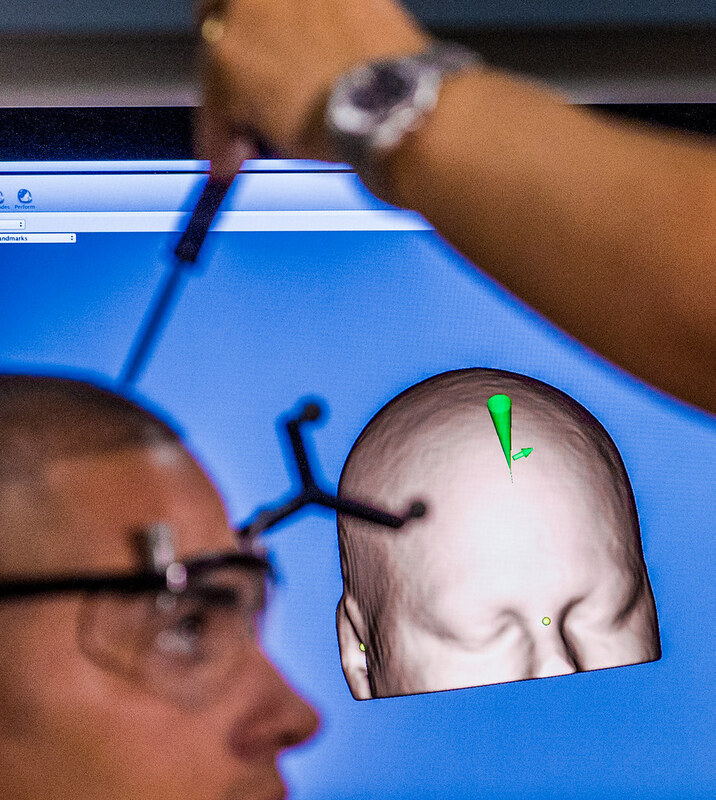 Researchers with the Non-Invasive Brain Stimulation (NIBS) Team calibrate the Brainsight Neuronavigation System to an Airman's head before attaching electrodes to administer directed electrical brain stimulation in the NIBS lab at the Air Force Research Laboratory, Wright Patterson Air Force Base, Ohio, Jul 19, 2016. 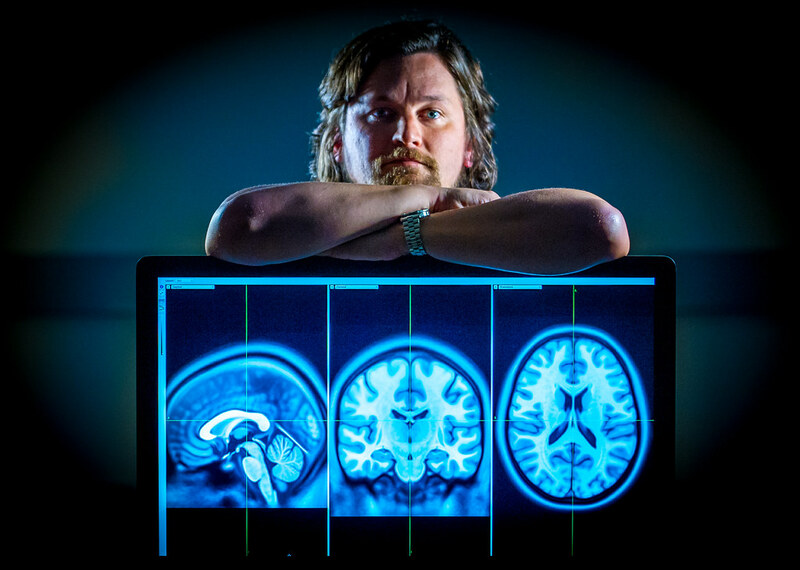 Researchers working in the NIBS lab, led by Dr. Richard A. McKinley, Ph.D., are exploring how directed electrical stimulation to the human brain affects cognition, fatigue, mood and other areas with the end goal of improving warfighter awareness, memory and focus. The doc throws the switch. I have to admit, for the next 30 minutes I felt a bit like the monster in Mary Shelley’s novel, “Frankenstein”— a science project made of flesh and blood; but I put my concerns aside for the chance to become superhuman. Besides, how many can say they were part of a Defense Advanced Research Projects Agency (DARPA) funded experiment? After the 30 minutes is up, the doc has me back in front of the monitor, grinding through another series of tests – first with level 1 and then level 3 and finally, level 5. Before McKinley gives me the results of the experiment, he explains why the DoD has such an interest in tDCS research. “What we are exploring are ways of changing brain activity to increase performance on specific cognitive skills,” said McKinley. “We are focused on finding ways to sustain attention for long periods of time, which applies well to a variety of missions that the Air Force and other military functions do everyday. 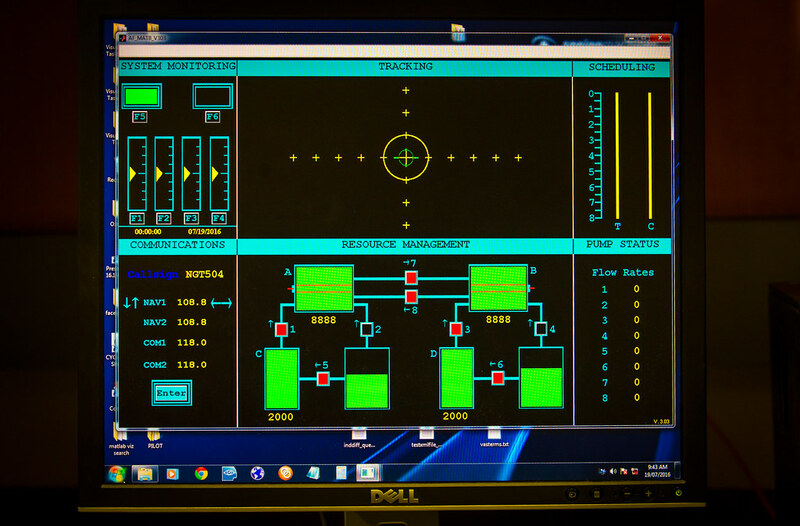 This research has real world, mission-enhancing potential and it is why some of the Air Force’s biggest brains were dedicated to the program. 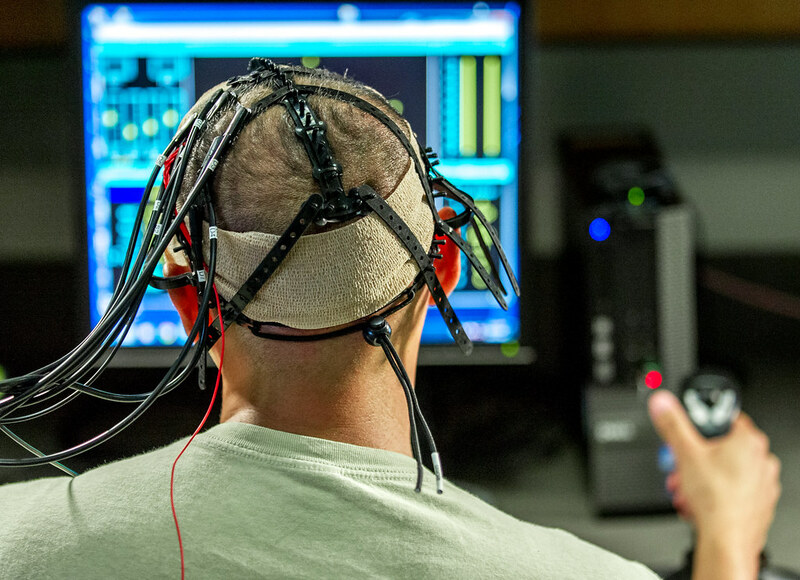 A test subject uses the Multi-Attribute Task Battery to perform a multitasking cognitive test while electrodes administer directed electrical brain stimulation in the Non-Invasive Brain Stimulation (NIBS) lab at the Air Force Research Laboratory, Wright Patterson Air Force Base, Ohio, Jul 19, 2016. 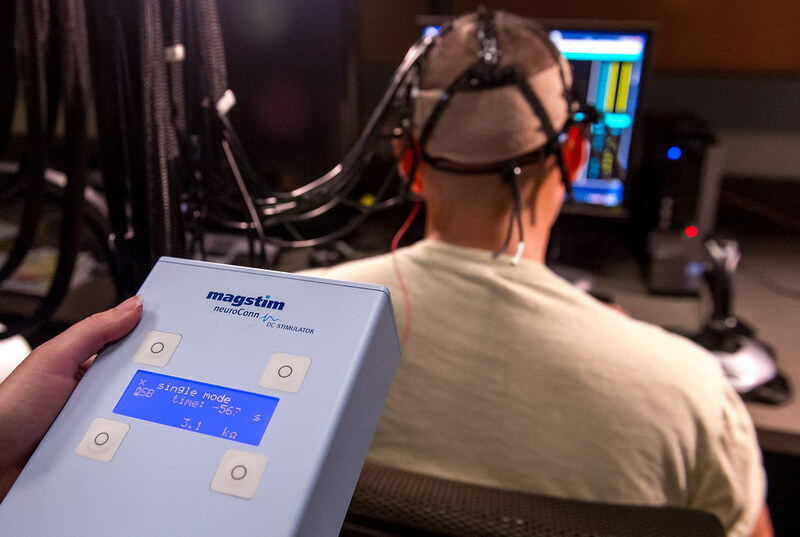 Researchers working in the NIBS lab, led by Dr. Richard A. McKinley, Ph.D., are exploring how directed electrical stimulation to the human brain affects cognition, fatigue, mood and other areas with the end goal of improving warfighter awareness, memory and focus. The only side effects are a dull tingle, an itchy scalp and a light residual burning sensation. Beside these annoyances, I felt amazing. My mental response was multidimensional — I had a vigorous jolt of energy, and was not easily distracted. When presented a problem, I solved it; when asked to multi-task, I prioritized more efficiently. And to think, this was just a half-hour charge. I couldn’t wait for my results. After a short deliberation, McKinley, with a smirk on his face, sauntered over with my scores. “How do you think you did?” McKinley asks. My enhanced brain was devising a plan to slide this device into my backpack without him knowing, travel back to my billet and start every day with an electric jolt of awesomeness. Then I realize the Air Force, and probably some three-letter government agencies, might take exception. Still, I wanted one! According to McKinley, tDCS is twice as effective and lasts three times as long as caffeine. It increases learning rates by 25 to 200 percent, wakefulness by up to 24 hours; and multitasking capability by a minimum of 30 percent at all monitored levels. 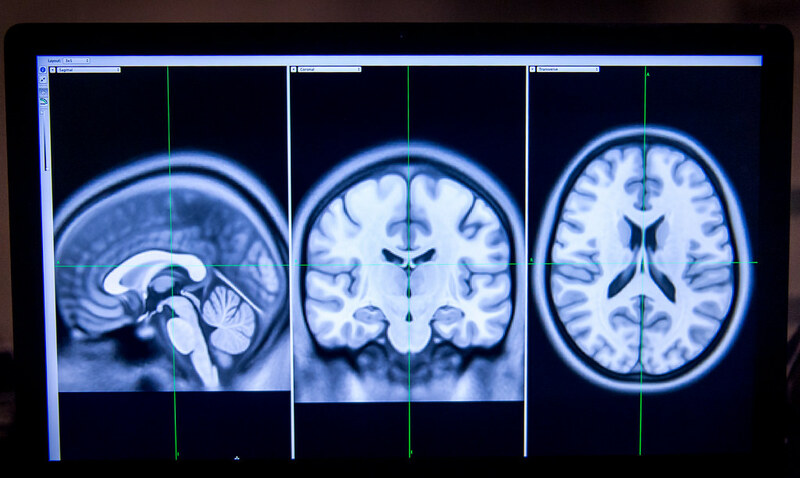 To me, the program made sense, especially as an alternative to the accepted widespread use of cognitive enhancing drugs such as Ritalin and Adderall. Transcranial DCS eliminates the negative side effects from taking a drug, is exceptionally cheap, remarkably portable, and user friendly. A functional imaging scan from a neuroimaging study performed by the Non-Invasive Brain Stimulation (NIBS) Team at the Air Force Research Laboratory at Wright Patterson Air Force Base, Ohio, shows the increase in brain activation from actual transcranial direct current stimulation (tDCS) compared with that of a sham consumer product. The NIBS lab, part of the Cognitive Performance Optimization Section, Applied Neuroscience Branch, Warfighter Interface Division, Human Effectiveness Directorate of the 711th Human Performance Wing, explores how directed electrical stimulation to the human brain affects cognition, fatigue, mood and other areas with the end goal of improving warfighter awareness, memory and focus. Courtesy photo // Dr. Richard A. McKinley, Ph.D. The pressures that pilots, air traffic controllers, imagery analysts, cyber defense operators and special forces face are immense. The amount of information being processed at any given time is seconds away from reaching sensory overload. Add operational stress on both the body and mind and one moves closer and closer to a system meltdown. As McKinley and his team continue to research tDCS , they also contemplate its integration into military operations. However, because the method of application involves the most important part of human functioning, the brain, the transition from concept to reality is challenging. As the program progresses, increasingly positive data is being gathered in support of the technology. Several studies have suggested that tDCS may even be a valuable instrument for the treatment of neuropsychiatric conditions such as depression, anxiety, Parkinson’s disease, and chronic pain. If and when tDCS goes operational for the military, McKinley hopes to have the technology readily available to all. When someone needs that extra surge of energy or a boost in concentration, they could just put on a helmet or pull out a device from their backpack and “voilà”! Wait. Since when do I speak French?  Archived in Research & Technology. Bookmark the permalink.